Quality packaging essentials designed to save you money in the long run. Perfect businesses both large and small, as well as at- home usage. Whether starting a new business in booming sectors or if you fancy setting up shop at home, packaging supplies can be an expensive outlay. To make things as easy and cost effective as possible, we have created our brand new economy range. 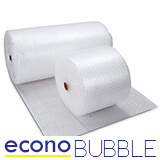 From tough and durable cardboard boxes to a multitude of bubble wraps, the econoRANGE is kept permanently in stock - and always in high quantites. This means that you can place an order before 2:30pm on a working day and we will aim to get your packaging to you the next working day. You will find all the products on this page, as well as helpful blog information to peruse at your leisure. 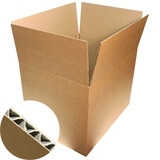 The econoBOX cardboard cartons come in three different strengths and sizes. 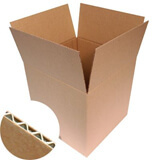 The Easifold is a handy smaller carton that is perfect for packaging single goods. The Standard is a sturdy and versatile carton of a medium size, whilts the Stronger carton is the largest of the bunch. As the cartons get larger in size, their board grade increases. So, when you package up more and more items, the cardboard isn't weakend by the weight. Available in both brown and white colouration, the econoPOST boxes first and foremost adhere to post office mailing regulations, making the delivery process all the more simple for you. There's up to 35 sizes to choose from, too - so you're covered no matter what you need to post. 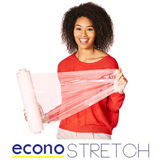 The goal of the econoSTRETCH is for you to use less packaging materials when sending out bulk orders. This helps save money whilst being a bit more gree at the same time. It's strong, it's durable, and so easy to use when stabilising your pallets loads - for either storage or deliveries. 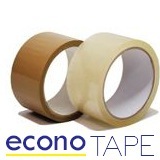 Designed for all-purpose packaging needs, the polypropylene econoTAPE is available in buff or clear film - ideal for your branded packaging. When we say all-purpose, we mean all-purpose, too, thanks to the acrylic adhesive. And don't go thinking you can only stick this tape to cardboard; the glue adheres to metal, plastics - even glass. 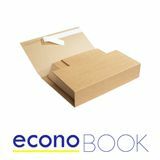 The econoBOOK comes in two different formats: one with adhesive tape and one without. 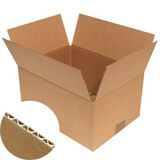 They represent of the best value for money products we stock, and arrive flat-packed to save you on storage space. They are designed with ease of use in mind - pre cut folds ensure a speedy packaging process. All you need to do is pop in your books and adjust to the size you need. Simple. The great thing about using polystyrene as packaging peanuts, as well as offering super packaging protection, is that it is completely eco-friendly. It's a great alternative to tradional void fill, simpy down to the fact that it has a green stamp and a great potential for re-use. The problem with sending out letter these days is that they can often get crumpled up in the mass of post that's tryning to get delivered. Envelopes get battered and important deliveries may arrive shabby. 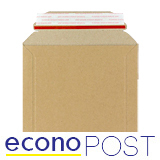 Fortunately, the econoPOST Envelopes are designed to protect against that, whilst offering a terrific professional look to your postage at the same time. They even come with their own adhesive tape; no more licking necessary. econoKRAFT recycled paper is a cost effective equivalent to the pure kraft. 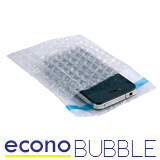 Ideal for retail or mail order use, perfect for wrapping products and packages. 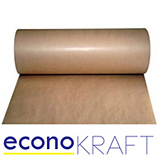 These econoKRAFT paper rolls are made from recycled paper, with a slightly lower burst strength than the alternative pure kraft version. 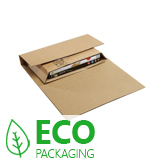 Extremely effective for general wrapping applications, saving you money whilst being environmentally friendly. 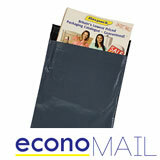 econoMAIL Bags are ideal for posting light weight items and bulky items alike through the post. 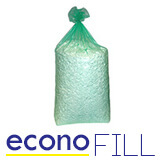 Made from a high quality polythene coex material, these bags offer a waterproof packaging option for your items. They have a 50mu thickness and a self seal strip for your convenience. 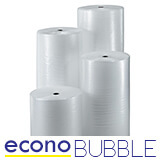 Our economy packaging supplies are designed to save you money while offering quality solutions for storage, transportation and general packing purposes. Try our econoRANGE today and save even more with our generous quantity discounts!